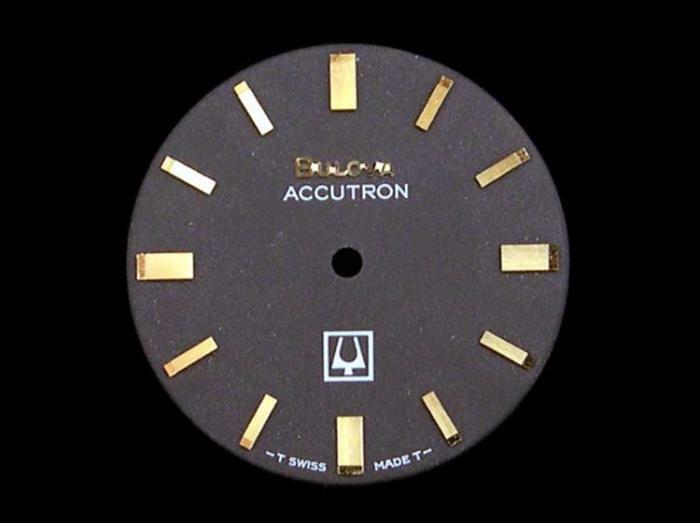 Bulova Accutron 214 movement, Black dial that says "BULOVA ACCUTRON" below the 12 o'clock mark, just above the 6 o'clock mark it has the tuning fork logo in a box, just below the 6 o'clock mark it says "T SWISS MADE T" on the dial, It has no serial number on the back just the date code N7. Nice watch, but is non-original dial. Dial has been refinished. Maybe a change of hour and minute hands too. The reason I think it is non-original is the "T swiss T" on the dial. That means it should be tritium illuminated on hands and dial, and it has neither. The dial hasn't been refinisted because i just found two more just like it. This one is at mybob.net in his list of factory dials ! Good find, but still incorrect. The "T" either side of the "Swiss Made" means tritium dial (numbers/markers) and hands. Strange that the watch ( or those dials!) has neither. 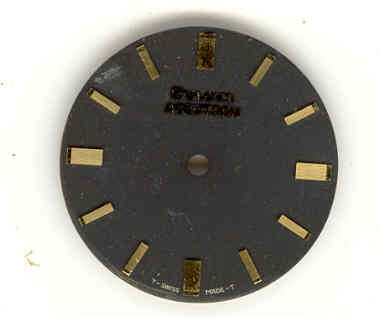 It's a very unusual dial in that it is flat and does not get sandwiched between the movement and the case but instead it is in fact small enough to go by the lip that stops the movement from going any further into the case, i have found three dials the same as this one and only one of them is missing the fork logo in the box but they all have the "T" on the dials, very unusual and the only one of this type i have ever seen like this. Yes but the "T SWISS MADE T" is printed on the dial it's self, how can you change the dial with out losing the "T SWISS MADE T" ? I would say that the entire dial was replaced. I don't know exactly when Bulova switched from radium to tritium but believe it was after 1967. At this point, I'm leaning toward Non-Conforming. I like the watch, it presents very nicely. I will have another look for a match, it might help with the original format of this model. And an ID, of course. Shoddy workmanship.... They forgot to put the minute hand back on! !